There is something refreshing about a brilliant, cool sunrise on a clear Wisconsin morning in Door County. I had just pulled up to a local coffee roasting company and was greeted by the cheery owner who was repositioning pots of bright flowers to better showcase her homey shop and eatery. At the advice of a friend with local ties, I had arranged to take part in a Coffee College mini-lesson to learn more about the origins, production and consumption of my favorite morning brew. My classmates and I carried steaming mugs of various coffee blends along with us to a comfortable conference room where we began our short lesson. My coffee had an essence of cherry in it – a nod to the cherries that put Door County on the map in the late 1800s. 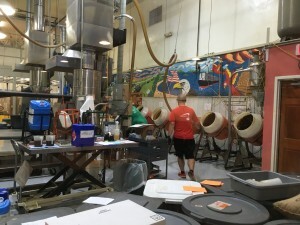 Roasters add flavor to gourmet coffee blends in Door County, Wisc. As we would learn from Vicki Wilson, the owner of Door County Coffee & Tea Company and our instructor, where a bean is grown and its specific quality are essential to the flavor of any coffee. On a mural of the world, she pointed to the countries from which her beans are procured and showed us a life-sized example of a coffee tree where she demonstrated how beans are picked by hand. Wilson passed around beans of different qualities and a plate of coffee grounds that exhibited three kinds of coarseness for various brewing methods; I use a coffee press and need a coarse grind, but my husband needs a medium grind for his drip coffee maker. Along with her hands-on samples, Wilson had an information-packed PowerPoint presentation and answers to all of our questions. Who knew there was so much to learn about this historic and global morning potion? At the end of our lesson, she pointed a remote control at the back wall of the room, and curtains rose to reveal coffee roasters at work in her small factory. In plastic drums along one wall, we watched a worker add flavor to beans that tumbled inside them like miniature cement mixers. Wilson clearly has a passion for her profession, and she delights in having her whole family involved in various parts of the company she began over two decades ago. After a creative and hearty breakfast called the Kitchen Sink that included eggs, potatoes and French toast in a sinful and delicious mix, I grabbed a steaming cherry decaf to go and headed north on the peninsula to the Ridges Sanctuary. This, too, was at the recommendation of a friend who knew I was taking a weekend to relax in Door County, and it was a spot-on suggestion. A lovely, modern interpretive center welcomed me with information about why the area is called the Ridges. Historical documents, satellite images and old photos adorn the walls, and an interactive video explains the area’s topography. The Great Lake Michigan laps up against Door County’s peninsula at Baileys Harbor, WI, but centuries ago, the lake level was much higher. Each time the lake receded from shore, it left a ridge of sand along the bank that grew trees and bushes and became its own small ecosystem. An aerial view of the sanctuary shows nearly 10 such ridges have resulted from the ebb and flow of Lake Michigan. Between each is a swale of marsh lands, a low-lying area that was once beachfront property before the next ridge was formed. Visitors enjoy a guided walk through the ridges and swales of Baileys Harbor in Door County, Wisc. The video helped visualize how these ridges and swales were formed, but it was a guided walk through the sanctuary with a well-educated naturalist that brought it to life. 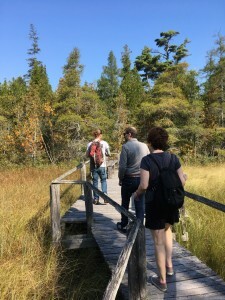 We left the interpretive center on a wooden boardwalk through a lush forest and learned about orchid restoration projects and the difference between deciduous and evergreen conifers. The deeper we pushed into the forest, the more rustic the boardwalk became. We navigated bridges over marshes and padded on mossy paths through forests that varied based on each ridge’s age. One boardwalk was strikingly different than the rest. It was poker-straight and set in a wide-open swath of clear-cut forest. At either end was a restored structure that I learned were range lights from the mid-1800s. Inside the larger building was a docent who explained that we were in a home as well as a navigational beacon. In its cupola was a bright white light that, when aligned with the bright red light from the smaller building, would guide shipping vessels into the rocky harbor. 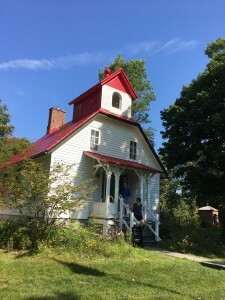 The range lights were in service from 1869-1969 when the house evolved into being a minister’s home and then a private residence. Fortunately, it is being restored by donations and has already been re-approved by the US Coast Guard as an operational range light. Who knew there was so much to learn in a northern forest? For a century, this range light helped guide ships through the dangerously rocky Baileys Harbor in Door County, Wisc. I was able to walk the range lights’ boardwalk down to a sandy beach along Lake Michigan and dip my toes in its cool water. Tucking into my jacket as the breezes tossed my curls, I savored what had turned out to be a delightful day of relaxing education. Drip, drop; the rain echoed on my rubberized hood, and squeak, squish; my boots scuffed across the rough boat deck for better balance. 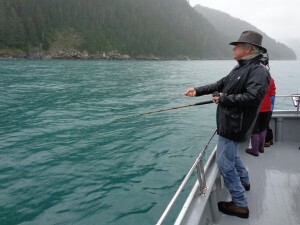 Click, whizzz…I disengaged the bale on my reel and flung my line out into the rich, green water that pattered playfully in the gentle rain and added to the cacophony of sound that is fishing in the arctic summer waters of Resurrection Bay outside Seward, Alaska. “Fish on!” yelled a fellow fisherman on the other side of our boat, and I heard thumping feet rush to grab a metal framed net that scraped across the floor and shot out into the water where a 15-pound silver salmon splashed and flipped into it. Plop- another bait hit the water, and then click, click, click, it was carefully reeled in to entice another silver. The anticipation was exciting, but who knew fishing would be so noisy? Fog and rain surround an intrepid fisherman in search of a prize-winning salmon. I was in Seward for a long weekend and had every intention of landing enough salmon to ship home and enjoy for months to come. Fortunately, I was there in early August when the silver salmon make their appearance in droves as they move toward the streams where they were born in hope of leaving the eggs that will continue their age-old life cycle. I was on a boat with experienced fisher people and had enough enthusiasm for all of us. Fortunately, I was not disappointed, and soon I was the person yelling, “fish on!” as the crew scrambled to net my catch. The day before had also been spent on the water, but on a much bigger vessel where I was an observer more than a participant. I was out for the day to look at the wildlife that teems in Alaska’s verdant summer waters. In a chilly August breeze I found my perfect perch near the bow of the boat where I could better see breaching killer whales and diving puffins, but I soon realized that the best view was at the back of the vessel out of the wind where the deck was clear of other adventurers. Our experienced captain shared statistics and details as he guided his tour toward pods of humpback whales previously spotted by other boats in the area. Gently, he steered us into tight coves where cormorants and puffins perched side-by-side, and gulls swooped down to catch abundant fish for lunch with a screech as they soared by. Near the mouth of Aialik Bay, he introduced his passengers to the endangered Steller Sea Lions who make their homes in these abundant waters. We cozied up to a tiny island where a harem of these giant creatures lazed in the sun and were barked at by the even larger male, as we got too close for his comfort. Leaving these noisy creatures behind, we headed deep into Aialik Bay past Holgate and Pederson Glaciers to the bay’s namesake, Aialik Glacier. Again, the noises surprised me. As we neared the tidewater glacier I could hear the gentle thump of ice cubes against the hull of our vessel and a sound like tinkling glass as the ice chunks clinked against one another in our wake. The air cooled even more, and ahead of us loomed the glacier whose massive size was more vast and breathtaking than I had imagined it would be. The blue crevasses of pressed snow folded in on one another and calved in chunks that splashed into the bay with clattering echoes that resounded in the silence left by the wise captain who had stilled his engines for the majestic display. 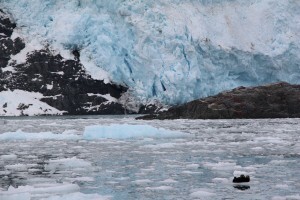 Two otters play in the icy water near Aialik Glacier in Kenai Fjords National Park. Turning back toward Seward, we were escorted out of Aialik Bay by a playful pod of Dall’s Porpoises that surfed the bow waves of our boat and leapt from the water in graceful arcs. Their bon voyage display was matched by the greeting we received from the small and sleek endangered sea otters who make their home in the Seward harbor with a few harbor seal friends. The antics of these aquatic creatures all inspired the whirs and clicks of dozens of cameras that sought to capture their elusive charm. For those of us who were too gob smacked by reality to think of training a camera on the quickly moving creatures, the Alaska SeaLife Center in Seward provides up-close encounters with a variety of marine mammals and birds. Built on the site of the former harbor that was lost in a devastating 1964 earthquake, this building is filled with educational hands-on exhibits and is home to injured animals that are being rehabilitated to go back into their natural habitat. I stood transfixed as an enormous Stellar Sea Lion glided past me with only a thick pane of glass between us. In another exhibit I learned that puffins swim; they actually dive below the water and flap their wings as if they were high in flight as they seek the fish upon which they feast. Still intrigued by the salmon run, I was fascinated by the mounted fish that show the physical changes endured by these prehistoric animals as they move through their life cycle. 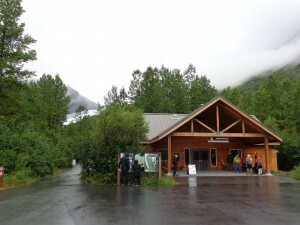 Prehistory was recounted for me again as I drove up toward Exit Glacier through the temperate rain forest. Small signs along the road indicate where the glacier’s toe reached hundreds and thousands of years before people ever recorded their visits to this wilderness. As I moved from ancient forests into more recent forests and then new growth, I could see for myself the effects of the receding glacier has on the land beneath and around it. Moving downhill from the same Harding Ice Field that feeds the tidewater glaciers I had visited two days before, Exit is the only glacier in Kenai Fjords National Park that is easily accessible by road, and it boasts a creative hands-on nature center where the ice fields, glacial movement and archeology of the area is explained through interactive displays. A knowledgeable park ranger is also available to answer questions and lead a daily hike up to the edge of the glacier. Exit Glacier peeks through the trees behind a nature center that educates hikers about the rapidly-melting glacier before they hit the trail to visit it themselves. I opted to explore the windy path on my own and feel the gravity of my impermanence as I neared such an awe-inspiring and primeval force of nature. I could hear the gravel crunch beneath my feet and knew it was deposited there by the giant ice flow. It was one more sound to remember from my summer retreat to Seward and the temperate rainforest of the Kenai Fjords.